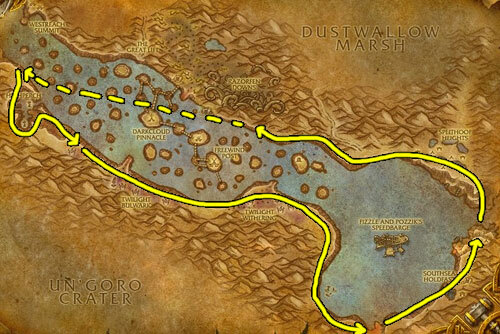 Sungrass is a great herb to farm, it is worth quite a bit of gold because it is used while leveling alchemy. It tends to be worth anywhere from 2 to 4 gold each, meaning a stack will fetch you 40-80 gold depending on your realm and economy. It sells best in stacks of 20 and in stacks of 5. If you just got back from farming a bunch of Sungrass, slowly release it 2-4 stacks of each size at a time over several weeks to maintain a high price. Do not expect to be able to sell it all in one evening because there just isn’t enough demand for it. In order to farm Sungrass, you need to have at least level 230 Herbalism and be at least level 40. You will find a ton of it in level 40-50 zones. Update: You can make a lot of gold with Sungrass, but if you want to step it up and make thousands of gold you should read my personal favorite guide. 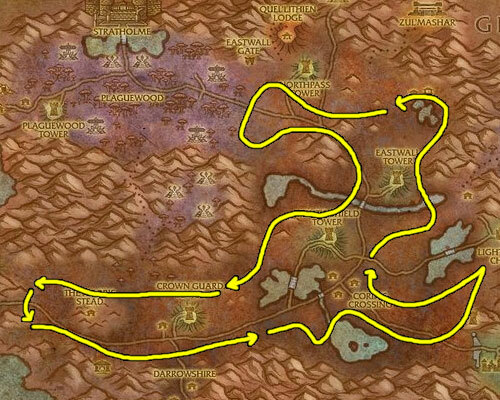 The best place to farm Sungrass is in Eastern Plaguelands. You will find this all over the interior of this zone, from the path from WPL to Light Hope’s Chapel and along the paths and hills to the north west. However, you will NOT find any Sungrass in the plagued area. Stay out of there if you are farming Sungrass.